There is a processing delay when changing an email address. Please check back in 6 to 8 hours and try to login again. Sometimes the process can take up to 24 hours. CAN I ORDER PRODUCTS FROM THE NSP CATALOG FOR MY FRIENDS AND FAMILY? Yes you can! Unlike the NSP Pro Deals page the NSP Catalog is open for you to shop for yourself, for your friends, and for your family. The only exclusions are any official patrol wear products, those are for NSP patrollers only. 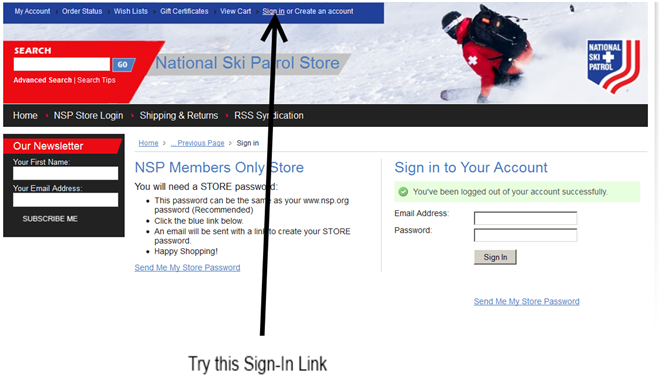 Login with your email address exampleEmail@example.com, and the Store password you created in Step 2. #2. Option 2 - Use the Sign-In button at the top of the screen.